Sri Harimandir Sahib, Amritsar, Punjab is part of the Tentative list of India in order to qualify for inclusion in the World Heritage List. The Sri Harimandir Sahib (a.k.a - “Golden Temple”), was 15th on our Community list of “Top Missing” but is, as yet, unreviewed by any Community member (just once - by a “guest”) – I wonder why?? We too had missed it across a number of other visits to N India. The city of Amritsar, where it is situated, is a bit of a “cul de sac”, with the Pak frontier only c30kms away and the more travelled routes from the South into the Himalayas to Shimla, Manali and Leh all turn off before you reach it. In Feb 2019 we finally made it and found it well worth the journey. 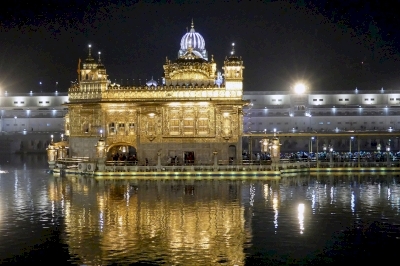 Being the Sikh religion’s most “holy place”, it is a very active pilgrimage site. The relatively few non-Indian “tourists” are totally lost within the throng of devotees of varying degrees of fervour. There are “rules”, but the whole atmosphere is extremely friendly, with the Sikhs determined to demonstrate/explain their beliefs in openness, tolerance, brotherhood and equality to anyone entering with respect. Shoes and socks must be deposited at a counter and a head covering worn. A range of rather fetching scarves is available which are the normal choice for non-turban wearing locals! Entry is through a shallow stream of cleansing running water. You will immediately see signs stating “Photography and Videography is strictly prohibited in the precincts of Sachkhand Sri Harimandar Sahib (Golden Temple). The spiritual centre of the World. (The Manager)”. We were told that this is a relatively recent addition to the rules and that it is in fact being rather loosely “enforced”. So (as of Feb 2019) there was no need to deposit cameras and mobiles etc as was to be the case at many of the Jain Temples we later visited on our trip. In fact, the biggest “culprits” are Indians (both Sikh and non-Sikh) taking personal snaps and selfies. There may yet be a further "tightening up"!! As you enter through the main gateway you look down on a rectangular man-made pool, at the centre of which (seemingly) “floats” the main “Golden Temple” itself - reachable only across a causeway. Around the pool is a wide walkway and, outside that, the entire square is surrounded by buildings. As you circulate (clockwise) you will pass various shrines and halls and further entrances on the other 3 sides. Whether or not you are there at the time of a particular festival or service there will be continuous chanting relayed through speakers from the central point, and giant screens display the words of the hymns. Everywhere people are engaged in “activities” both religious and profane at one or other of the buildings. And there lies the problem for the “ordinary” Western tourist not versed in matters “Sikh”!! What are these buildings and what is going on! Without some “translation”, it is a bit like watching an unknown opera in a foreign language – you can get a rough idea but miss some aspects of the main plot and a lot of the detail!! Why are all those people sitting in different rooms reading different copies of the Holy Book (Guru Granth Sahib), what are those story tellers and musicians with a rapt audience sitting at their feet, talking/shouting about??!! As you walk round the pool you will hit the “photography” issue. There are magnificently turbaned and bearded guards with long sharply pointed spears who will admonish (no “worse”!!) those attempting to photograph across the pool - but there are relatively few of them and, as long as one avoids obviously insensitive actions such as snapping bathers etc or taking a photo inside the central temple, there should be no problem. Getting inside the Golden Temple itself however could be one! During our visit there was always a queue of devotees running the entire length of the Causeway and beyond (If you happened to visit on the day of a major festival it could be far, far, even impossibly, longer!). If you have time then you could take your place in it and add to the overall experience. Another way in for non-devotees seemed to be to use the exit path and slip inside the exit door of the building itself thus not passing across the front of the "Sanctum Sanctorum" (SS). Our guide got us in past the guard “on the nod” and probably anyone else could do so just by themselves? This gives perfectly adequate views of the inside where the Holy Book is read during the day, together with the ability to climb up to a first floor for a view of the SS from a balcony and then by climbing to the roof to go outside and get a 360 degree view of the Temple. One area not to be missed is the “Guru kar Langar” dining hall and its associated kitchens and food preparation areas. To get to it you actually have to step outside the main temple through the eastern gate (through another stream of water!) – on the left up some steps you will immediately see enormous piles of metal plates and bowls being handed out to anyone who wishes to partake of a simple meal. As a tourist you would not be excluded and you could take your place in the dining hall sitting cross legged on the floor with hundreds of others awaiting your helping of dal and chapati (many “tourists” do)! Even if you don’t (we didn’t) you are free to wander round and see/photo the preparations. Go upstairs for another view of the temple. I would also plan to visit the Temple across both day and night time. If truth be told we were perhaps a little bit disappointed with the “Goldenness” of the Temple when we saw it in the afternoon of a rather misty day. Going back in the evening with the whole structure now lit up gave a much enhanced impression (photo). This "double" visit fits in well with a trip up to the Atari-Wagah Indo/Pak border (c30kms away) for the "Lowering of the Flag" ceremony in the late afternoon. So – what are the chances of this site being inscribed? It was added to India’s T List in 2004 and nominated just 1 year later. But that nomination was withdrawn 1 month before the 2005 WHC at India’s request - what was going on??? India had embarked on a “beautification plan” for Amritsar as long ago as 1988. See this report from 2004 which also includes comments made by the ICOMOS representative carrying out his evaluation for the nomination. So, it is possible that the nomination was withdrawn in 2005 simply because of unfavourable comments by ICOMOS regarding management/buffer zones etc etc. However - note the suggestion that a significant aspect of the “beautification” objectives were to improve security access to the Temple after the 1984 military operation. Lack of trust between Sikhism in general/the guardians of the Temple in particular and the Indian government continues to poison the atmosphere regarding any Golden Temple nomination. Nevertheless, the above report claims that “This dossier was presented by the Government of India in collaboration with the SGPC and the Punjab Government”. The “SGPC” is the “Shiromani Gurdwara Parbandhak Committee” which runs the Golden Temple. Since 2005 the “beautification” project has continued into its 6th and 7th (!!!) phases with the implication that all is not yet well with the environment and management of the areas around the Golden Temple which would presumably constitute any buffer zone. See this from 2010, this from 2013 and this from 2016. The current main entrance to the Golden Temple is indeed via a large new marbled piazza and the main street to the area has been pedestrianised and beautified with the addition of statues etc. Whether this is enough to satisfy ICOMOS – who knows? The low number of petition votes didn’t seem to indicate that hostility to inscription is widespread among the Sikh community overall but, unless and until the governing body of the Temple changes its mind, it wouldn’t seem that even the completion of the long running “Beautification” project will be enough to lead to the site’s nomination!